CEDIA-registered install outfit Cre8tive Rooms took up the challenge, and delivered this eye-catching solution. Work time on the project was a rapid 15 days. 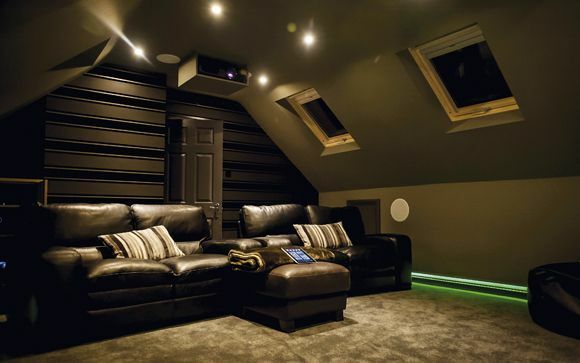 As befits a modern home cinema, Ultra HD projection and Dolby Atmos audio are catered for. A Sony VPL-VW320ES projector, mounted to the ceiling at the rear of the room, fires at a 2.5m-wide projector screen. The chosen ratio of 16:9 means it's suited to both movies and bigscreen sports. The speaker configuration is 7.1.2. In-wall and in-ceiling UniQ driver models from KEF's Ci line are used for the front LCR soundstage (hidden from sight behind the screen) and the Atmos overhead channels. Two-way Flatbox speakers from Swedish brand DLS are sited on-wall for the surround and rear channels. Providing audio processing and 110W-per-channel amplification is a Yamaha RX-A1050 receiver. Source gear for the cinema includes a Sony Blu-ray player and PlayStation, Sky+HD and Apple TV. These are housed in a wall-mounted rack on the car-side of the garage, in addition to the hardware for the Savant smart control system that makes driving the cinema room easy. Perhaps the most startling aspect of this conversion is the window between the cinema and the other side, a key demand of the owner. The solution is clever, as at times it is transparent, and other times hides its secret with a reflective surface. Having a window in this position isn't perhaps ideal when it comes to room acoustics, yet the installers found the glass didn't have as much of a reflective property as expected. Again, sticking to a tight budget meant bespoke room treatments weren't an option, but the carpeted floor and quartet of soft-fabric recliners help dampen acoustics, and the speaker/amp system was fully calibrated. The end result is a space that surely hits the unusual brief – a garage conversion that still finds space to park a car, and makes a feature of it too. Now, where'd we leave our Fast & Furious boxset?